Technology that could see an end to the bane of many commuters - people talking loudly on their mobile phones - has been shown off by researchers. The prototype device could allow people to conduct silent phone conversations. The technology measures the tiny electrical signals produced by muscles used when someone speaks. The device can record these pulses even when a person does not audibly utter any words and use them to generate synthesised speech in another handset. "I was taking the train and the person sitting next to me was constantly chatting and I thought 'I need to change this'," Professor Tanja Shultz of the Karlsruhe Institute of Technology told BBC News. "We call it silent communication." The device, on show at the Cebit electronics fair in Germany, relies on a technique called electromyography which detects the electrical signals from muscles. It is commonly used to diagnose certain diseases, including those that involve nerve damage. 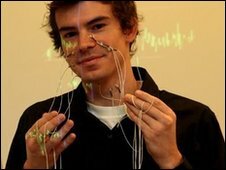 The prototype that is on display in Germany uses nine electrodes that are stuck to a user's face. "These capture the electrical potentials that result from you moving your articulatory muscles," explained Professor Shultz. "Those are the muscles that you need in order to produce speech." The electrical pulses are then passed to a device which records and amplifies them before transmitting the signal via Bluetooth to a laptop. There, software translates the signals into text, which can then be spoken by a synthesiser. In the future, said Professor Shultz, the technology could be packed in a mobile phone for instantaneous communication. "We know this is not appealing for mass market use at the moment." However, she added, it could be initially used to help people who have lost their voice due to illness or accident. It could also form the basis of an instant translation system, she said. "You could speak in your mother tongue and the text could be translated into another language," she said. "The person that you are communicating with would then hear the synthesised voice in the other language." It is not the first time that electromyography has been explored for silent communication. 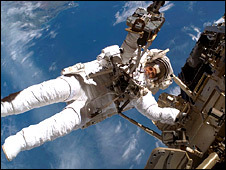 The US space agency Nasa has investigated the technique for communicating in noisy environments such as the Space Station. It has also used the technique to explore advanced flight control systems that do away with joysticks and other interfaces. Nasa, she said, explored the technique to understand simple commands. "The difference with our system is that we can record and recognise continually spoken sentences," said Professor Shultz. Cebit runs from 2 to 6 March in Hanover, Germany.